Hong Kong's pension system is quite recent and based on a strong occupational pillar. The public pillar is intended to provide a social safety net for the needy. The occupational pillar is a mandatory defined contribution system that has been in operation since 2000, and the third pillar comprises voluntary pension savings. The introduction of the mandatory occupational pillar, called the Mandatory Provident Fund Scheme (MPF), has been the biggest change to Hong Kong's pension policy over the last decades. Before the MPF system was established, occupational schemes existed, but only on a voluntary basis with limited coverage. These Occupational Retirement Schemes Ordinance plans still exist. Further reforms will very likely deal with the fine-tuning of the MPF system. Recent reforms affected transparency and MPF fund disclosure as well as supervisory issues. Demography was one of the main reasons why a formal pension system was established. With 0.97 children per woman, Hong Kong has the lowest fertility rate in the world, while life expectancy is among the highest in the world. As a result, the current population is one of the oldest in Asia, after Australia and Japan. The old-age dependency ratio stands at 16 today, and will increase to 58 in 2050. Assets under management in the Mandatory Provident Fund scheme amounted to EUR 20.8 billion in 2006, while assets in the Occupational Retirement Schemes Ordinance plans stood at EUR 21.5 billion. Assets in the former are likely to grow by 15.4% per year until 2015, while the latter will see annual growth of 1%. The overall social security system in Hong Kong has five subsystems. The Social Security Allowance Scheme covers the elderly and includes old age and disability allowance. The scheme for retirees is divided between 65 to 69-year-olds (Normal Old Age Allowance) and over 70-year-olds (Higher Old Age Allowance). It provides flat rate benefits of currently EUR 61 (HKD 625) a month for the former and EUR 69 (HKD 705) for the latter, and is financed entirely from the state budget. The Normal Old Age Allowance is means-tested, while the Higher Old Age Allowance is not. The official retirement age is 65 for both men and women. In 1997, a reform was passed that introduced the Portable Comprehensive Social Security Assistance scheme. It allowed retirees over 60 who receive social security benefits to settle in the bordering provinces of Guangdong or Fujian while continuing to receive their benefits. The idea behind this scheme is that the cost of living is lower in these provinces than in Hong Kong, enabling retirees to enjoy a higher standard of living. Other public schemes cover civil servants, judicial officials, school teachers and the staff of public hospitals and clinics. Civil servants who started working in or after 2000, however, were no longer allowed to join the old public pension schemes; they had to join the MPF system first. They are eligible to join the Civil Service Provident Fund scheme only once they have received permanent contracts. The contribution rates for this scheme, which are covered by the government, increase according to years of service. The MPF system became law in 1995 and was implemented in late 2000. Until then, there were voluntary occupational schemes that emerged in the 1970s and 1980s and were established mainly by larger companies. Except for tax breaks, these schemes were practically unregulated. This changed in 1993, when the Occupational Retirement Schemes Ordinance (ORSO) regulated occupational pensions to protect participants and support scheme establishment. ORSO schemes, which can be of the defined benefit, defined contribution or hybrid type, covered around 30% of the formal workforce. Contribution rates varied depending on scheme regulations. After the MPF system was introduced in 2000, these schemes were allowed to continue operating and be exempt from MPF requirements, provided that they met certain standards specified by the Mandatory Provident Fund Schemes Authority. ORSO scheme members were given the one-time choice between staying in the existing scheme and joining the new MPF scheme. From 2001 to 2006, the number of ORSO schemes decreased from 9,800 to 7,700. 512,000 employees are now covered by the schemes. Of the 7,700 schemes, about 83% are defined contribution schemes. Assets under management amount to EUR 21.5 billion (HKD 221 billion). The MPF system is based on mandatory personal defined contribution accounts. Participation is mandatory for full and part-time employees between 18 and 65 years of age, provided that the latter have been employed for more than 60 days. Employers and employees contribute 5% of wages each, up to a limit of EUR 1,949 (HKD 20,000) a month. The self-employed must also contribute 5% of their income. The employers choose the MPF scheme, which is provided by banks, insurance companies, asset managers and trust companies. Master trust schemes are by far the most popular type of MPFs. Out of 41 schemes, 37 are master trust schemes, two are employer-sponsored schemes and two are industry schemes. The two industry schemes were established for the employees of the catering and construction industries, in which labour mobility is high. As long as members stay in the same industry, they do not need to change plans. Employers, employees and the self-employed can make additional contributions voluntarily. Registered MPF schemes may consist of one or more constituent funds, each of which must be approved by the Mandatory Provident Fund Schemes Authority. The funds must provide differing investment policies, and employees must choose between them. Most schemes offer four to six options, one of which must be a capital preservation fund. Asset managers must be independent of the scheme's trustees and the custodian. They must also be a company incorporated in Hong Kong, have a certain amount of paid-up share capital and they must be licensed to manage assets and carry out related business. MPF coverage is high: 99% of relevant employers and 98% of relevant employees are covered, as are 74% of the self-employed. In the case of employer-sponsored MPFs, no more than 10% of assets may be invested in securities of or issued by the employer or an associated company. As of late 2006, there were 315 approved constituent funds offered in the MPF system. 292 of these were in master trust schemes. Balanced funds are the most commonly offered type of fund (137), followed by equity funds (84), capital preservation funds (41), guaranteed funds (31), bond funds (17) and money market funds (5). The popularity of the different fund classes is reflected in asset distribution between the different funds. Balanced funds account for more than half of all assets in the system, followed by equity and guaranteed funds. Hong Kong remains the preferred location in terms of geographical asset allocation. In 2006, the MPF constituent funds allocated 53% of their assets at home, while 14% were invested in Europe, 8% in Asia (excluding Hong Kong), 7% in North America and 18% in other regions. The MPF system is consulting-intensive. More than 24,400 registered intermediaries are in the business of selling and/or advising on MPF schemes, the overwhelming majority of which are individual advisors. 19 trustees are authorised to conduct MPF business. Benefits are paid out as lump sum; members are not required to annuitise their capital. Contributions are tax-deductible up to a maximum of EUR 1,170 (HKD 12,000) a year for employees and up to 15% of salary for employers. 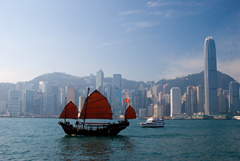 Investment income and benefits are tax-exempt, which means that Hong Kong runs an EEE system. The MPF system has reached one of its main goals, namely comprehensive coverage of the working population. The system has been successfully implemented and will provide the main share of pension income for future retirees. The lack of a comprehensive social insurance system as a public pillar remains an issue, however. Its absence may lead to insufficient retirement income, especially for low-income earners. This may result in MPF participants making overly conservative investment choices, as they try to avoid the risk of unfavourable returns on their MPF assets. Other current discussions focus on the question of whether the MPF's targeted replacement rate of 30-40% is realistic in light of the current system's parameters, particularly the relatively low contribution rate. There have been proposals to raise mandatory contributions or the contribution cap. A conversion of lump sum payments and employee choice of the MPF provider are also being debated. Despite such unresolved issues and the short time that it has existed, the MPF system has evolved into a solid and working foundation for Hong Kong's retirement system.